Time for an update on our watery wanderings. We’ve been up and down the canals and rivers, round and about, back and forth, ping and pong. You get the picture. It is mid-September and the nights are chilly. No, the nights are downright cold and the winter-weight down comforter has been dragged out from its storage bag (the plastic thing that hooks to the vacuum cleaner, a set of twelve of which Harvey had tucked away along with the service for eight magic Ginzu knives – “cuts steel and slices paper!” – the Popeel Poket Fisherman -“fits in your glove compartment for all those times you have to fish RIGHT NOW” – and the Bassomatic juicer; some people can’t resist making a toll-free call at 3:00 a.m. after a 45 minute infomercial between science fiction films). It is getting to be time to think about the Other Half of the year in France, the six months during which the barge stays in one place and we travel through Europe the way normal people do, by train and plane. Our travels took us up the gorgeous Rhine au Rhon Canal, heading eastward toward the border with Germany. This canal followed the Doubs River through mountain gorges in the most sparsely populated region of France. Cliffs rose on both sides. When it rained – and sometimes it was torrential – the river rose, too, as much as a meter in one night, and we got to play white water rafting in a 70-foot iron raft. It was exciting at times but, as with all good adventures, those you survive become stories, those you don’t survive don’t much matter. We stopped at three great cities on this canal: Dole, Besancon and Montbeliard. We’d planned on going as far east as France goes (meaning to Germany) and onto the Rhine River but ran into the Rhine Regulations for boats over 20 meters: you need a Rhine license, with a medical examination that for some reason was only available in Basil, Switzerland, and a special Rhine certification for the boat. Some folks take their chances and skip all that but we’d heard some horror stories about those who did get stopped by the French or German River authorities (the border runs down the middle of the river). We chose not to roll those dice and backtracked down the river we’d come up. There was another route to our planned winter mooring in Epinal in Lorraine. Here we are in the city of Gray on the River Saone. The tourist office lady was surprised to see a U.S. flag on an old barge and took our photo for their web site. But while on the Doubs our son Ben, daughter-in-law Carolyn and grandkids Noah and Abram spent a couple of weeks with us and became addicted to pain au chocolate at breakfast every day. We understand they are going through withdrawal now. Then a few weeks later our son Sam, and his buddy Tom, came by before leaving to pick grapes in Champagne (another story for another time). They had a mix of cities – Besancon and Dole – and country, including our favorite wild mooring on an island in the middle of the River Doubs alongside a dam and down the road from what we were told was Voltaire’s favorite cavern, which we visited. After leaving Sam and Tom at the Dole train station we set off on our mission to Epinal, 250 kilometers and 90 locks away. Epinal has a wide mooring basin with stone walls and electricity and water available all winter. We’d traveled there in our rental car in March and loved the city. We played it safe, or so we thought, and reserved a winter mooring space, even paying a deposit of 200 euros to hold our spot. Oh how clever and cautious we were. 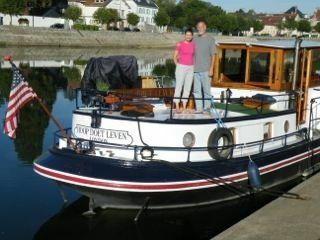 Most of the trip would be up the River Saone, wide, deep and slow-moving with widely-spaced locks, perfect for covering many kilometers each day. All in all, easy barging. Epinal is located on an old canal that seems to change its name from time to time. Our charts – which admittedly were printed in 1991, but, then, canals and rivers move their positions awfully slowly – called the canal the Canal de l’Est (sud branch). Other maps called it the Canal de Vosges. Under whatever name, it turns out Epinal is not quite “on” the canal, but it is pretty “near” it. It turns out the difference between being “on” and “near” is significant, as in the difference between “winter in Epinal” and, as the apocryphal story about asking directions in Maine goes, “ya cain’t get thee-ah from hee-ya.” What connects the harbor in Epinal with the nearby canal is a three kilometer long “deviation,” a small canal with no locks, but a fascinating flooded bridge that takes boats over a river. That three kilometer canal is shallow. In summers such as this one, which got off to a wet start but turned dry, “shallow” became that Maine expression. According to the canal authority web site, we just couldn’t get there, or more precisely, we could but the barge, which needs 1.3 meters of water to float in, couldn’t. We were in the same situation as a radio conversation we’d overheard in Florida on the Intracoastal Waterway, in which a self-important sounding skipper called a bridge tender on the radio demanding to know if he needed the bridge to open for him and saying his boat needed a clearance of twenty feet. Will my boat fit under the bridge, he shouted into his radio. The bridge tender calmly replied, “most of it will.” Well, most of Hoop Doet Leven could get through the Epinal canal, but certainly not the lower few feet of the boat, not without lowering our wheels. This seemed an odd situation. We called the harbormaster – the Capitaine – in Epinal. He spoke no English but understood Sandra’s increasingly coherent French. He seemed to tell us just to come, not to worry, see you soon, thanks for calling, and some other things, none of which included that the port and the canal had shut down for the winter, that every boat in the port had to leave by the middle of August and that he was a Capitaine de port without a port to be Capitaine of. Nonetheless, that telephone conversation encouraged us to head north, up the river toward Epinal. Sandra was less confident in her French comprehension, however, and we asked the daughter of some Ipswich friends, a daughter living in France and speaking French, if she would speak with the canal authority – VNF – for us and confirm that we would be able to float all the way to Epinal. She made the call and reported back that VNF said the canal to Epinal was closed for the winter. Go someplace else, they said. Anyplace but not Epinal. Before Sandra clicked off the cell phone Harvey had the boat doing an abrupt U-turn in the middle of the River Saone. It was time for Plan B.
Fortunately, we were not far from Saint Jean de Losne (“the Barge Capital of France”). We found winter space at a recently-constructed facility in the nearby town of Auxonne. This would put us in Bourgogne so there would be snails all winter and wine, wine and more wine. It is a 30 minute train ride to Dijon, so we would never run out of mustard, and Sandra could take French lessons there. We’re booked into this port now and are making winter plans, which include triple checking the boat’s heating system. We’ll be moored under the walls of a fortress from the days when Auxonne protected the border from the Austro-Hungarian Empire and a young artillery lieutenant named Napoleon Bonaparte spent three years there learning a few things military. But before going into hibernation, we’re doing one last trip, a few weeks in Dijon, back up the Canal de Bourgogne, one of our favorite places in France. We’ll fill the mustard tanks, stock the freezer with frozen snails, maybe take the train to Beaune for wine shopping. Then, some time in mid-October, it will be back to Auxonne, goodbye to Epinal, and snuggling down in one place for the winter. We’re planning on lots of European travel, mostly to warm places, the south of France, maybe Spain, maybe Greece, maybe Italy. Lots of time to plan next summer’s canal cruising. I see that Harvey’s grown a beard…the ol’ salt. 🙂 Great pic…more great stories…and hats off to you both. I’m exhausted…and pretty lost in terms of traveling from place to place to frequently. I think ‘settling’ in for the winter sounds like a plan 🙂 Look forward to more ‘European vacation’ episodes. Hugs to you guys!